Can I Substitute Matzo Meal for Flour? Matzo CAKE meal might work in some recipes in small quantities, but you are safer using a recipe specifically designed for matzo cake meal. Regular matzo meal is never appropriate for a dessert. Yes, use cake meal, which is the consistency of flour. Matzo meal is more akin to breadcrumbs. Also see Lippy's caveat. Whatever you make, it's going to taste like matzo (i.e., something already baked). I just made my K for P mandelbrot last night, and that was my first thought when I tasted the dough. interesting, since I'd thought of making a frangipane. It seems that 45% of passover desserts are macaroons and 45% are flourless chocolate cakes.10% are cheesecake. Like Lippy said, almond flour is best as a substitute, especially if less than a cup of flour is called for. Substituting matzo cake meal might work if your recipe calls for less than a half cup of flour, but i'd search for recipes already designed for use of matzo cake meal because they take into account the pre-baked texture. you will almost always need t add an extra egg. My mother substituted Motzah meal for flour -- and the results always sucked. Cautioning that commercial almond flour is very expensive, compared to both matzah flour and flour. Make a nice fruit and nut plate! How about this - it's quite good. From Penelope Casas. 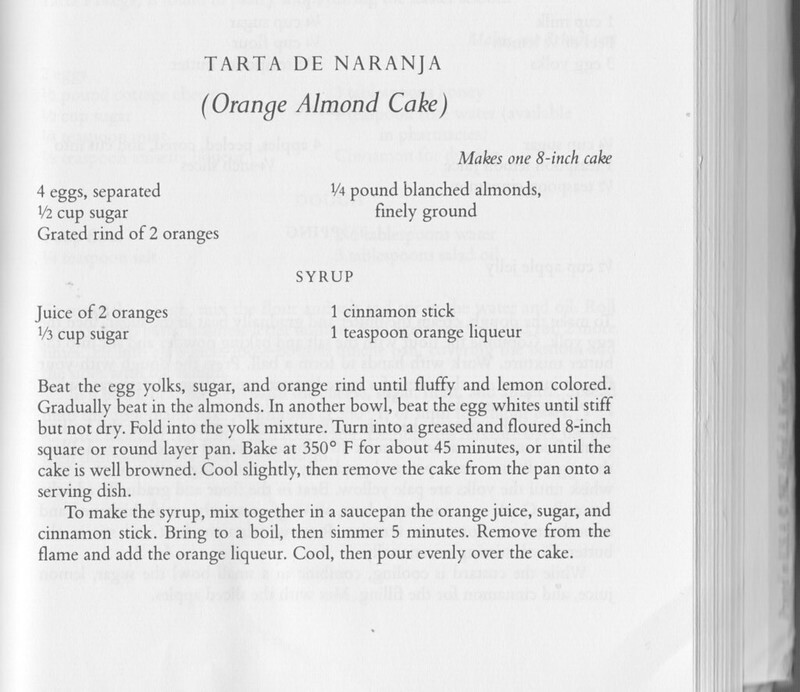 I've made it (the tarta de naranja) a number of times, and it always comes out nicely - and it's easy, too! Lippy's tip about adding a little of the recipe's sugar (a tablespoon or so) when grinding the almonds is a great one too. If you make the Roden recipe you can use Trader Joe's ground almonds, which is coarser than Almond Flour, but I think works better. I would not take a regular sponge cake and replace the flour with cake meal. Rather, I would find a passover specific sponge cake recipe. Last year, the best thing I made was a tart. Crust was made with coconut (shredded and flour) and I filled it with an olive oil lemon curd. I remember that tart, and that I wanted to try to make it, or at least the crust. Did you post the crust proportions somewhere? I will have to sift through my emails (I email myself recipes I want to make) to see if you did. Something "fruit" was my easy-way-out thought. Like strawberries in hibiscus syrup. Is the expectation of a cake or torte a generational thing? Like the scriptures of my father's family's Thanksgivings? Change or delete at your peril.